Sensa Core’s ST-200 aQua Electrolyte Analyzer is completely automated, microprocessor controlled electrolyte system that uses current ISE technologyto make electrolyte measurements. 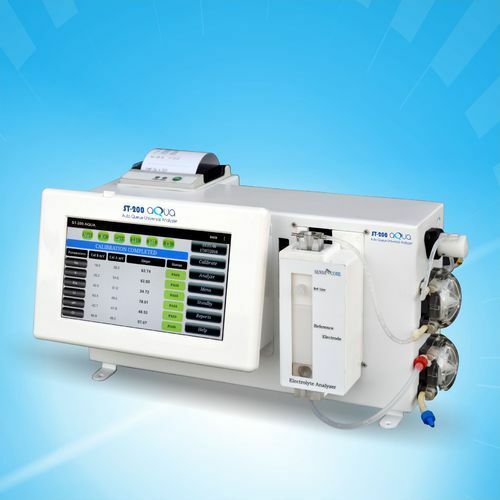 The ST-200 aQua product measures various combinations of Sodium, Potassium, Ionized Calcium, Lithium, pH and Chloride in whole blood, serum, plasma, CSF, body fluids and urine. Sensa Core's ST-200 aQua Electrolyte Analyzer is specifically designed to meet the needs of small to medium-size laboratories using the latest ISE technology. Sensa Core’s Electrolyte Analyzers improve lab productivity, while delivering sample results economically. Snap-in electrode design, combined with precise control of calibrator volumes, ensure economical operation and a low cost per sample in our Analyzers. Maintenance of Sensa Core's ST-200 aQua Electrolyte Analyzers is limited to the replacement of Reagent Pack Pump Tube. Rest of the components are just plug and play, including Maintenance-Free Electrodes. 18 Samples at a time in batch processing (Optional). Basic model (without auto-sampler) is also available. Levey-Jennings chart for NABL and seamless integration to LIS(Lab information system). 7" inch high definition LCD with capacitive touch display. Dispense 100μL sample and acquire 6 different Critical Care results. One set of Reagent Pack is common for all 10 combinations. Numeric alpha numeric input option with 15 digit operator patient ID. External barcode scanner, mouse keypad interfacing option. Single touch calibration for new reagent pack. Maximum 2,00,000+ sample storage capacity. Optional battery backup much more. Sensa Core Medical Instrumentation intends to become Innovative World Class Medical Diagnostics Instrument Manufacturer. Sensa Core’s mission is to provide Hospitals, Pathological Laboratories and OEM clients and Patients with Advanced Analytical and Diagnostics Analyzers and Hand-Held Devices, which would improve Patient Outcomes and Reduce the Cost of Medical and Healthcare Services. We will ensure that we deliver products and services of the Highest Quality and ensure our Products are User-Friendly, Low Maintenance, Easy to Operate and Easy to Afford.